We're so happy to share this special news with you! We are thrilled to announce the arrival of our baby! Are you looking for baby announcements that will have everybody going "oohh...awww.... that's amazing, how adorable." 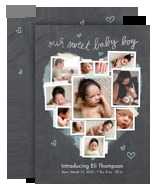 Custom birth announcements announce more than a birth, they announce your child is precious/handsome/pretty/perfect enough to be pictured right on your personalized birth announcement. Your kid is picture worthy, so make your own birth announcements, and let the world know.